$17 Advance / $20 Day of Show. 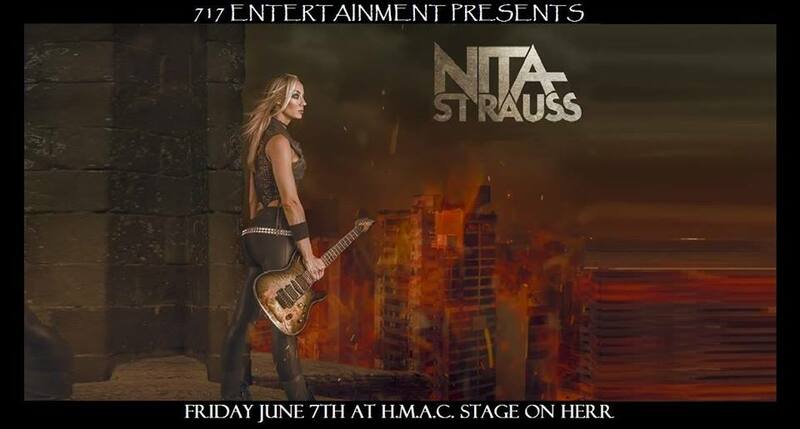 Los Angeles born guitarist Nita Strauss has become a force to be reckoned with in the music world, dazzling audiences across the US, UK, Europe, Asia and Africa, and sharing the stage with a diverse range of artists including legendary R&B star Jermaine Jackson, deathcore heavy hitters As Blood Runs Black, early MTV darlings Femme Fatale, video game supergroup Critical Hit and popular tribute band The Iron Maidens. Her skill, exuberant stage presence and love for all things about her instrument have earned her a stellar reputation and endorsements from many top companies. Nita has been featured in many worldwide print ads and on dozens of albums, trailers, and soundtracks, most recently Heroes Of The Storm (Blizzard) and Grammy-nominated Metal Gear Rising: Revengeance (Konami/ Platinum Games), and is the author of the Premier Guitar column “Drop Dead Shred”. She was ranked #1 of Guitar World’s “10 Female Guitar Players You Should Know”, and has been featured in Revolver Magazine’s annual “Hottest Chicks in Hard Rock” issue and calendar for the last 2 years. She is currently on tour with Alice Cooper.